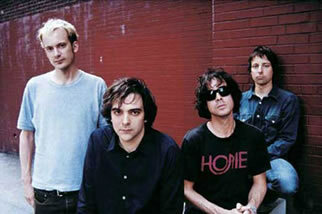 Power pop outfit FOUNTAINS OF WAYNE is best known for their single “Sink to the Bottom” off their 1996 debut album. The band toured the world extensively behind the album, playing alongside bands such as The Smashing Pumpkins, Sloan and The Lemonheads. Bassist Adam Schlesinger wrote the title song for That Thing You Do!, earning him an Oscar nomination and an RIAA gold certificate for the hit soundtrack. In 1999 the band released its second album, Utopia Parkway, named after a road in Queens, New York. The album was something of a concept record that dealt with life in modern suburbia. Utopia Parkway was received well by critics, garnering many favorable reviews, and was album of the week in People magazine. The group once again toured extensively behind the album, but frustrations grew and the band was dropped by Atlantic in late 1999. The band was inactive for a period of time during which Schlesinger found work as a writer and producer and co-wrote many of the songs for the Josie and the Pussycats film and soundtrack. He also produced albums for the Verve Pipe and David Mead, as well as several tracks by They Might Be Giants. Sometime in 2001 the band slowly came back together, recording a cover of The Kinks’ “Better Things” for a Kinks tribute album. The group also recorded the theme song for the Comedy Central show Crank Yankers. The band subsequently released several albums and a concert DVD. They continue to tour in support of their upcoming album Sky Fulll of Holes.